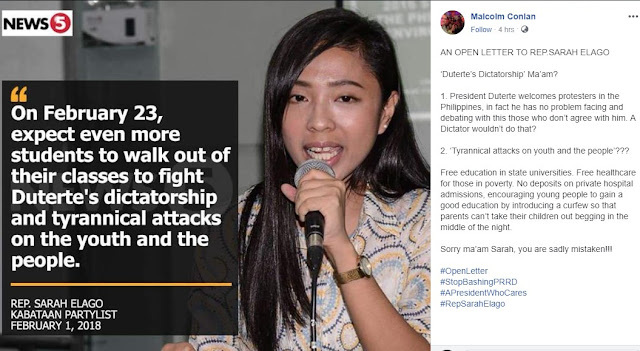 A concerned netizen and well-known British DDS Blogger Malcolm Conlan slammed Kabataan Partylist Rep. Sarah Elago for spreading fake news against the President of the Philippines. In an interview with News5, Rep. Sarah Elago was quoted as saying "On February 23, expect even more students to walk out of their classes to fight Duterte's dictatorship and tyrannical attacks on the youth and the people." Elago stated. The statement released by Sarah Elago through the mainstream media caught the attention of a British Duterte supporter Malcolm Conlan who issued an Open Letter intended to Rep. Sarah Elago defending the President and explaining the real issue. In the open letter which went viral on social media, Malcolm Conlan explained that Pres. Duterte is not a dictator because of the fact that he welcomes protesters in the Philippines, in fact, he has no problems facing and debating with those who don't agree with him, and a dictator wouldn't do such things. In the issue regarding the tyrannical attacks on youth and the people, how could that happen because of Pres. Duterte made an effort to sign Free Education in all State Universities and Colleges. There is also free healthcare for those in poverty and No Deposits on Private Hospitals Policy. Alvero Marky: Kaya tayong mga Pinoy matututo na bumoto ng tamang tao para sa gobyerno. Inocencia von Stumpfeldt: itung babaeng itu ay full of hatred sa sarile nya mismo..kailangan nya ng professional help ..
Lezde Notcab Oerbe: Pag ito pinasali sa isang debate or quiz bee im sure nagnaga to. Kasi lagi nasa kalsada nlng eh ano paba matutunan nito. Felix Soquena Golimlim: Adik yata ito! Wla sa tamang pag iisip! Nabigyan ng pagka2taon na mkpg trabaho sa govt sa dami ng wlang trabaho! Matalinong bata kung mg salita pero bakit ganun parang utak ipis!